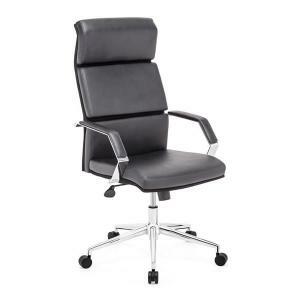 This high back modern desk chair is appealing and comfortable. It's a great office chair! The Lion High Back Office Chair has a high back with contours and a ribbed upholstery effect for comfort and design. The chromed steel frame and base make it very durable and it has tilt and height adjustments to make it a comfortable sitting experience. W21.7" x D27.6" x Height 47~49", Seat W19.7", SD18", SH16.5~18.5", Arm H25~27"